Our Best Selling Laser Welder! Easy to use, simple to maintain and incredibly powerful, the 990 Series iWeld Benchtop Laser Welding System fits neatly into any work environment. iWeld is the highest peak powered laser welding machine in its class. This machine welds SILVER along with other complex alloys. The iWeld is ideal for a wide range of metal joining and repair applications in the industrial marketplace. 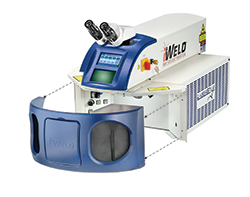 The system’s compact, portable, space-saving design, coupled with LaserStar’s well-known reputation for high quality, efficient laser sources, make the iWeld Benchtop Laser Welder an excellent value. Operators benefit from pin-point accuracy, increase the range of assembly and repair applications, and minimize the potential hazards of heat damage. The resulting weld is considerably stronger than a traditional solder joint. The comfortable, ergonomic design, with conveniently located operator controls and display, ensure optimal utilization with minimal operator fatigue. LaserStar’s commitment to electrical design efficiency ensures the highest level of hot-light energy transfer from the laser source through the laser welding chamber while providing many hours of continuous operation without overheating. As always, the iWeld laser welder is available in the domestic USA marketplace in 110 Volts or 220 Volts. iWeld laser welders offer an excellent value for today’s industry professionals looking to unleash the power of hot-light, benefit from a comfortable, compact, ergonomic design and ensure optimal platform technology. The iWeld Benchtop has a removable welding chamber for easily welding parts that will not fit within the standard welding chamber. The chamber is easily removed to allow users to weld larger or odd shaped parts. discharge. 3Additional languages available upon request. English language is default software. "The LaserStar laser welding machine is functioning great and is making an impact on three projects simultaneously. Easy to use, effective, flexible and looks pretty straight-forward to customize to our applications. We have not yet managed to transform water into wine with it, but give us time!"